Tonight’s movie, The Misfits, concludes the works of Ms. Marilyn Monroe and ends This (Slightly More Than) Month with Marilyn. We still have two more entries in the series with tomorrow’s review of My Week with Marilyn and an overall wrap-up of the series. I’ll go further into the housekeeping at the end of this entry. So on to The Misfits. The movie is bittersweet not only in the themes of humanity and connection it espouses, but also because it was the final, completed film from two legendary stars, Marilyn and Clark Gable. I didn’t care for the movie, but as a farewell from its two leads, and what it says about these actors entering into the 1960s makes it worthy of rounding out Marilyn’s body of work. Roslyn Tabor (Marilyn) is a divorcee looking to get away from it all. In Reno, Nevada she meets aging cowboy Gay Langland (Clark Gable) and his friend Guido (Eli Wallach) who offer Roslyn a vacation in a dilapidated house. After falling in love with Gay, the two meet rodeo cowboy Perce Howland (Montgomery Clift) who is mentally deficient after an accident. The three discover a need to connect after being damaged both emotionally and physically. 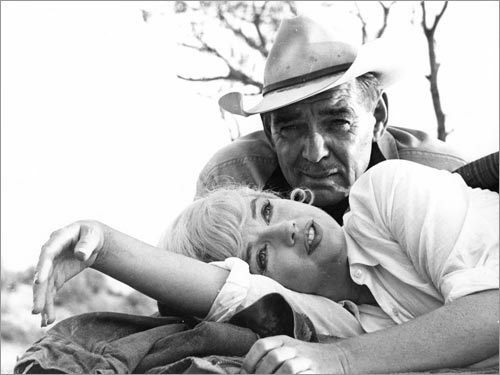 Directed by the equally iconic John Huston, The Misfits brought together three huge stars in Marilyn, Gable, and Clift. Each actor had been damaged in their own ways which peppered their performances. Marilyn had suffered a miscarriage awhile back, and had divorced from husband (and screenwriter of this film) Arthur Miller a month before its release. Montgomery Clift had been on a downward spiral for years after losing his looks in a road accident while Gable was rumored to have lung cancer (never proven or disproven) and was on the tail-end of his career. By the time this movie was released Gable and Marilyn would be dead, Gable six days after filming and Marilyn a year after release. Clift would die six years after this movie’s release. Gable and Clift were also products of a time gone-by which is reflected in their characters. Gable was a huge star throughout the 30s and 40s but by the 60s he was much like Laurence Olivier in The Prince and the Showgirl, trying to recapture his relevance by attaching himself to the next hot thing (Marilyn). His character of Gay is a man who has lost everything, his children want nothing to do with him, and women are there to be caught, roped and let go after a while much like roping a horse. Clift’s character, a turn on his success in the Western genre, has been handicapped by his rodeo days not unlike the accident that ruined Clift’s looks and star power. All three of the characters have such vulnerability in their performances and lean on each other equally throughout. Despite issues behind the screen, the trio each need adapt to these characters because they are the characters and therefore their performances are all genuine. Marilyn isn’t as fantastic as in her work like River of No Return but she is the character and is heartfelt. Her pleading for Gay to release the horses is tinged with such sadness. I wasn’t a huge fan of this movie, mostly because I’m not quite sure I’m a Huston fan but I enjoyed the deep-seated nostalgia, the need to connect in a time that will change so drastically in only a few short years. The characters in this have long conversations about children, and how a child can be brought up by such damaged people who were neglected in their own right. In a few years the effects of Vietnam and the Civil Rights Movement would make people question those very things. It’s almost like Miller and Huston were making a time capsule, capturing the beauty and simplicity of the country and the myth of the cowboy, while predicting that the times ahead would be even more hostile. 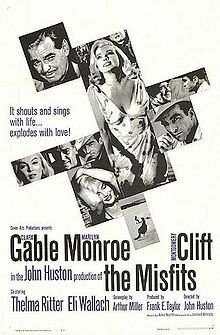 A lot to say about a movie I didn’t really care for but The Misfits should be seen by all the fans of Marilyn. The character is the most like her which should have been easy since Marilyn’s grand quest was always to understand the character in order to play her…here the character IS her! The melancholy that permeates the film is heightened because by the end of the year both the stars of this movie would be gone forever. So overall housekeeping: Marilyn concludes with my review of My Week with Marilyn as well as a final wrap-up of my favorite/least favorite movies and some other things and then it’s up to the readers to tell me what things they’d like to see next! Any movies suggestions or actors you’d like me to devote time to? I have a bunch more box sets I can do but I want to do a couple of individual movies before because this theme was hard for me to keep up with (as evidenced by the fact this lasted A LOT longer than a month). I have a few reviews backlogged in case I skip a day but I’m open for suggestions! Also, it seemed that my Top 10 Movies of 2011 review got a lot of readers so I’ll be putting up more of the work I post on my other site. 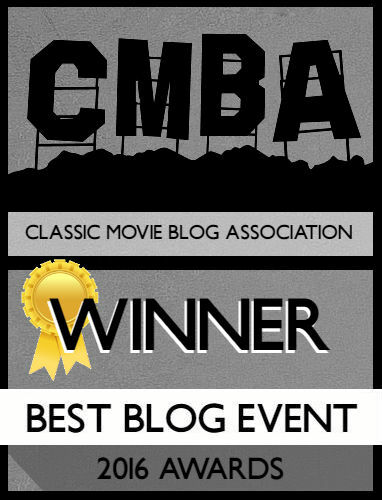 I’m the Movie Editor for CC2K Online so if you enjoy my work here I suggest you bookmark that site, if not I’ll be reposting my work on this blog. If you also enjoy my witty banter and want a more audio way of listening to me I do a weekly podcast called The Midnight Matinee where I discuss a movie and other entertainment related topics. 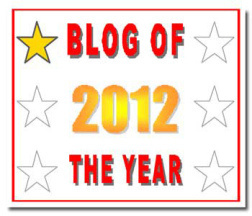 All these links can be found on the Blogroll! So start the suggesting and I’ll be back tomorrow with my review of My Week with Marilyn!